did not obtain the informed consent of research subjects. 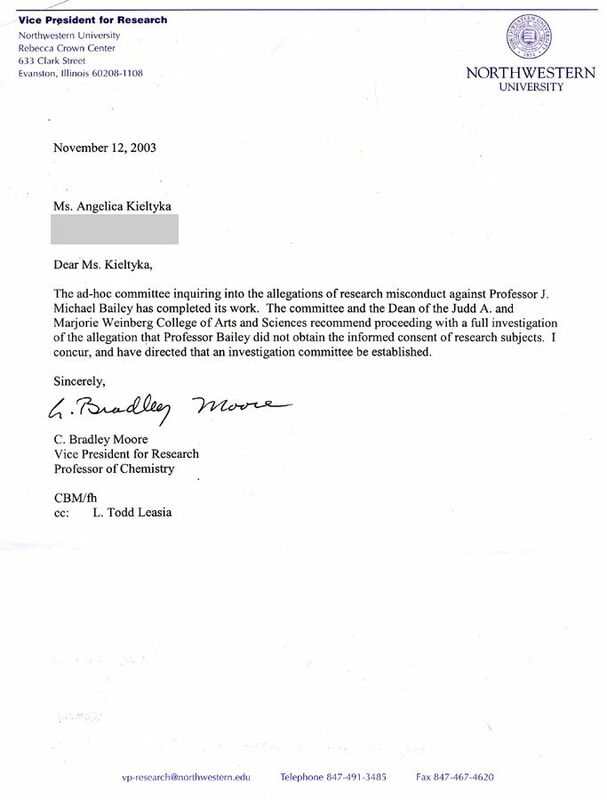 Below you will find below a scan and the text of a letter from C. Bradley Moore, Vice President for Research at Northwestern University, to Anjelica Kieltyka informing her that Northwestern will be conducting a full formal investigation of the charges that Prof. J. Michael Bailey did not obtain the informed consent of the transsexual women who were his research subjects for the work reported in his book The Man Who Would Be Queen. This is a very major development in the Bailey case, because it means that no stone will be left unturned now in the formal investigation of Bailey. By analogy with a legal casee, this action represents an "indictment" by Northwestern of Bailey on the charges that he conducted and published research on trans women without their informed consent. The Northwestern case now goes on to a full, formal University investigation, which by analogy to a legal case similar to an actual "court trial" on those charges. We take heart from this decision by Northwestern, and we look forward to providing input to the full formal investigation. If and when Prof. Bailey is found to have conducted research on human subjects without obtaining their informed consent, we expect Northwestern University to publicly sanction Prof. Bailey in an appropriate manner that is proportional to impact of his offenses. His research, and the book emanating from it, were personally, emotionally and socially incredibly harmful to the women involved. Therefore, appropriate sanctions would have to be serious ones indeed - the very first of which should be Prof. Bailey's permanent removal as Chairman of Psychology at Northwestern. Even now, while this investigation is underway, we think it would be best if Prof. Bailey were to temporarily step down as Chairman of Psychology at Northwestern. To remain in that powerful position while under the dark cloud of charges he faces would not be in the interests of the Department, nor would it be fair to the investigation. For more information on this important development, see also Andrea James' page Background: Northwestern University, which also contains links to a number of key individuals at Northwestern who were involved in the publication of Bailey's book. The ad-hoc committee inquiring into the allegations of research misconduct against Professor J. Michael Bailey has completed its work. The committee and the Dean of the Judd A. and Marjorie Weinberg College of Arts and Sciences recommend proceeding with a full investigation of the allegation that professor Bailey did not obtain the informed consent of research subjects. I concur, and have directed that an investigation committee be established.